Microsoft Word (or simply Word) is a word processor developed by Microsoft. It was first released on October 25, 1983 under the name Multi-Tool Word for Xenix systems. Subsequent versions were later written for several other platforms including IBM PCs running DOS (1983), Apple Macintosh running the Classic Mac OS (1985), AT&T Unix PC (1985), Atari ST (1988), OS/2 (1989), Microsoft Windows (1989), SCO Unix (1994), and macOS (formerly OS X; 2001). Commercial versions of Word are licensed as a standalone product or as a component of Microsoft Office, Windows RT or the discontinued Microsoft Works suite. Microsoft Word Viewer and Office Online are freeware editions of Word with limited features. In 1981, Microsoft hired Charles Simonyi, the primary developer of Bravo, the first GUI word processor, which was developed at Xerox PARC. Simonyi started work on a word processor called Multi-Tool Word and soon hired Richard Brodie, a former Xerox intern, who became the primary software engineer. Microsoft announced Multi-Tool Word for Xenix and MS-DOS in 1983. Its name was soon simplified to Microsoft Word. Free demonstration copies of the application were bundled with the November 1983 issue of PC World, making it the first to be distributed on-disk with a magazine. That year Microsoft demonstrated Word running on Windows. Unlike most MS-DOS programs at the time, Microsoft Word was designed to be used with a mouse. Advertisements depicted the Microsoft Mouse, and described Word as a WYSIWYG, windowed word processor with the ability to undo and display bold, italic, and underlined text, although it could not render fonts. It was not initially popular, since its user interface was different from the leading word processor at the time, WordStar. However, Microsoft steadily improved the product, releasing versions 2.0 through 5.0 over the next six years. In 1985, Microsoft ported Word to the classic Mac OS (known as Macintosh System Software at the time). This was made easier by Word for DOS having been designed for use with high-resolution displays and laser printers, even though none were yet available to the general public. Following the precedents of LisaWrite and MacWrite, Word for Mac OS added true WYSIWYG features. It fulfilled a need for a word processor that was more capable than MacWrite. After its release, Word for Mac OS's sales were higher than its MS-DOS counterpart for at least four years. The second release of Word for Mac OS, shipped in 1987, was named Word 3.0 to synchronize its version number with Word for DOS; this was Microsoft's first attempt to synchronize version numbers across platforms. Word 3.0 included numerous internal enhancements and new features, including the first implementation of the Rich Text Format (RTF) specification, but was plagued with bugs. Within a few months, Word 3.0 was superseded by a more stable Word 3.01, which was mailed free to all registered users of 3.0. After MacWrite Pro was discontinued in the mid-1990s, Word for Mac OS never had any serious rivals. Word 5.1 for Mac OS, released in 1992, was a very popular word processor owing to its elegance, relative ease of use and feature set. Many users say it is the best version of Word for Mac OS ever created. In 1986, an agreement between Atari and Microsoft brought Word to the Atari ST under the name Microsoft Write. The Atari ST version was a port of Word 1.05 for the Mac OS and was never updated. The first version of Word for Windows was released in 1989. With the release of Windows 3.0 the following year, sales began to pick up and Microsoft soon became the market leader for word processors for IBM PC-compatible computers. In 1991, Microsoft capitalized on Word for Windows' increasing popularity by releasing a version of Word for DOS, version 5.5, that replaced its unique user interface with an interface similar to a Windows application. When Microsoft became aware of the Year 2000 problem, it made Microsoft Word 5.5 for DOS available for download free. As of July 2018[update], it is still available for download from Microsoft's web site. In 1991, Microsoft embarked on a project code-named Pyramid to completely rewrite Microsoft Word from the ground up. Both the Windows and Mac OS versions would start from the same code base. It was abandoned when it was determined that it would take the development team too long to rewrite and then catch up with all the new capabilities that could have been added in the same time without a rewrite. Instead, the next versions of Word for Windows and Mac OS, dubbed version 6.0, both started from the code base of Word for Windows 2.0. Word for Windows is available stand-alone or as part of the Microsoft Office suite. Word contains rudimentary desktop publishing capabilities and is the most widely used word processing program on the market. Word files are commonly used as the format for sending text documents via e-mail because almost every user with a computer can read a Word document by using the Word application, a Word viewer or a word processor that imports the Word format (see Microsoft Word Viewer). Word 6 for Windows NT was the first 32-bit version of the product, released with Microsoft Office for Windows NT around the same time as Windows 95. It was a straightforward port of Word 6.0. Starting with Word 95, releases of Word were named after the year of its release, instead of its version number. Word 2010 allows more customization of the Ribbon, adds a Backstage view for file management, has improved document navigation, allows creation and embedding of screenshots, and integrates with Word Web App. In 1997, Microsoft formed the Macintosh Business Unit as an independent group within Microsoft focused on writing software for Mac OS. Its first version of Word, Word 98, was released with Office 98 Macintosh Edition. Document compatibility reached parity with Word 97, and it included features from Word 97 for Windows, including spell and grammar checking with squiggles. Users could choose the menus and keyboard shortcuts to be similar to either Word 97 for Windows or Word 5 for Mac OS. Word 2001, released in 2000, added a few new features, including the Office Clipboard, which allowed users to copy and paste multiple items. It was the last version to run on classic Mac OS and, on Mac OS X, it could only run within the Classic Environment. Word X, released in 2001, was the first version to run natively on, and required, Mac OS X, and introduced non-contiguous text selection. Word 2011, released in October 2010, replaced the Elements Gallery in favor of a Ribbon user interface that is much more similar to Office for Windows, and includes a full-screen mode that allows users to focus on reading and writing documents, and support for Office Web Apps. Microsoft Word's native file formats are denoted either by a .doc or .docx filename extension. The newer .docx extension signifies the Office Open XML international standard for Office documents and is used by Word 2007 and later for Windows, Word 2008 and later for macOS, as well as by a growing number of applications from other vendors, including OpenOffice.org Writer, an open source word processing program. During the late 1990s and early 2000s, the default Word document format (.DOC) became a de facto standard of document file formats for Microsoft Office users. [citation needed] There are different versions of "Word Document Format" used by default in Word 97–2007. Each binary word file is an (Object Linking and Embedding) OLE Compound File, a hierarchical file system within a file. According to Joel Spolsky, Word Binary File Format is extremely complex mainly because its developers had to accommodate an overwhelming number of features and prioritize performance over anything else. As with all OLE Compound Files, Word Binary Format consists of "storages", which are analogous to computer folders, and "streams", which are similar to computer files. Each storage may contain streams or other storages. Each Word Binary File must contain a stream called "WordDocument" stream and this stream must start with a File Information Block (FIB). FIB serves as the first point of reference for locating everything else, such as where the text in a Word document starts, ends, what version of Word created the document and other attributes. Opening a Word Document file in a version of Word other than the one with which it was created can cause incorrect display of the document. The document formats of the various versions change in subtle and not so subtle ways (such as changing the font, or the handling of more complex tasks like footnotes). Formatting created in newer versions does not always survive when viewed in older versions of the program, nearly always because that capability does not exist in the previous version. Rich Text Format (RTF), an early effort to create a format for interchanging formatted text between applications, is an optional format for Word that retains most formatting and all content of the original document. Plugins permitting the Windows versions of Word to read and write formats it does not natively support, such as international standard OpenDocument format (ODF) (ISO/IEC 26300:2006), are available. Up until the release of Service Pack 2 (SP2) for Office 2007, Word did not natively support reading or writing ODF documents without a plugin, namely the SUN ODF Plugin or the OpenXML/ODF Translator. With SP2 installed, ODF format 1.1 documents can be read and saved like any other supported format in addition to those already available in Word 2007. The implementation faces substantial criticism, and the ODF Alliance and others have claimed that the third-party plugins provide better support. Microsoft later declared that the ODF support has some limitations. A Macro is a rule of pattern that specifies how a certain input sequence (often a sequence of characters) should be mapped to an output sequence according to defined process. Frequently used or repetitive sequences of keystrokes and mouse movements can be automated. Like other Microsoft Office documents, Word files can include advanced macros and even embedded programs. The language was originally WordBasic, but changed to Visual Basic for Applications as of Word 97. This extensive functionality can also be used to run and propagate viruses in documents. The tendency for people to exchange Word documents via email, USB flash drives, and floppy disks made this an especially attractive vector in 1999. A prominent example was the Melissa virus, but countless others have existed. These macro viruses were the only known cross-platform threats between Windows and Macintosh computers and they were the only infection vectors to affect any macOS system up until the advent of video codec trojans in 2007. Microsoft released patches for Word X and Word 2004 that effectively eliminated the macro problem on the Mac by 2006. In Word 2004 for Mac OS X, support of complex scripts was inferior even to Word 97, and Word 2004 does not support Apple Advanced Typography features like ligatures or glyph variants. Microsoft Word supports bullet lists and numbered lists. It also features a numbering system that helps add correct numbers to pages, chapters, headers, footnotes, and entries of tables of content; these numbers automatically change to correct ones as new items are added or existing items are deleted. Bullets and numbering can be applied directly to paragraphs and convert them to lists. Word 97 through 2003, however, had problems adding correct numbers to numbered lists. In particular, a second irrelevant numbered list might have not started with number one, but instead resumed numbering after the last numbered list. Although Word 97 supported a hidden marker that said the list numbering must restart afterwards, the command to insert this marker (Restart Numbering command) was only added in Word 2003. However, if one cut the first item of the listed and pasted it as another item, e.g. fifth, the restart marker would have moved with it and the list would have restarted in the middle instead of at the top. The second and the third type of passwords were developed by Microsoft for convenient shared use of documents rather than for their protection. There is no encryption of documents that are protected by such passwords, and Microsoft Office protection system saves a hash sum of a password in a document's header where it can be easily accessed and removed by the specialized software. Password to open a document offers much tougher protection that had been steadily enhanced in the subsequent editions of Microsoft Office. Key length in Word 97 and 2000 was strengthened up to 40 bit. However, modern cracking software allows removing such a password very quickly – a persistent cracking process takes one week at most. Use of rainbow tables reduces password removal time to several seconds. Some password recovery software can not only remove a password, but also find an actual password that was used by a user to encrypt the document using brute-force attack approach. Statistically, the possibility of recovering the password depends on the password strength. Word's 2003/XP version default protection remained the same but an option that allowed advanced users choosing a Cryptographic Service Provider was added. If a strong CSP is chosen, guaranteed document decryption becomes unavailable, and therefore a password can't be removed from the document. Nonetheless, a password can be fairly quickly picked with brute-force attack, because its speed is still high regardless of the CSP selected. Moreover, since the CSPs are not active by the default, their use is limited to advanced users only. Word 2007 offers a significantly more secure document protection which utilizes the modern Advanced Encryption Standard (AES) that converts a password to a 128-bit key using a SHA-1 hash function 50000 times. It makes password removal impossible (as of today, no computer that can pick the key in reasonable amount of time exists), and drastically slows the brute-force attack speed down to several hundreds of passwords per second. BYTE in 1984 criticized the documentation for Word 1.1 and 2.0 for DOS, calling it "a complete farce". It called the software "clever, put together well, and performs some extraordinary feats", but concluded that "especially when operated with the mouse, has many more limitations than benefits ... extremely frustrating to learn and operate efficiently". PC Magazine's review was very mixed, stating "I've run into weird word processors before, but this is the first time one's nearly knocked me down for the count" but acknowledging that Word's innovations were the first that caused the reviewer to consider abandoning WordStar. While the review cited an excellent WYSIWYG display, sophisticated print formatting, windows, and footnoting as merits, it criticized many small flaws, very slow performance, and "documentation apparently produced by Madame Sadie's Pain Palace". It concluded that Word was "two releases away from potential greatness". 1990 Word for Windows 1.1a Old version, no longer supported: 1.1a On March 25, 2014 Microsoft made the source code to Word for Windows 1.1a available to the public via the Computer History Museum. 1991 Word for Windows 2.0 Old version, no longer supported: 2.0 Code-named Spaceman Spiff[citation needed]. Included in Office 3.0. 1993 Word for Windows 6.0 Old version, no longer supported: 6.0 Code-named T3[citation needed] (renumbered 6 to bring Windows version numbering in line with that of DOS version, Mac OS version and also WordPerfect, the main competing word processor at the time; also a 32-bit version for Windows NT only). Included in Office 4.0, 4.2, and 4.3. 2006 Microsoft Word 2007 Old version, no longer supported: 12.0 Included in Office 2007; released to businesses on November 30, 2006, released worldwide to consumers on January 30, 2007. Extended support until October 10, 2017. 2010 Word 2011 Old version, no longer supported: 14.0 Part of Office 2011. As with the Windows version, 13 was superstitiously skipped. 2015 Word 2016 Older version, yet still supported: 16.0 Part of Office 2016. Again, renumbered alongside the Windows version. ^ "Release notes for Monthly Channel releases in 2019". Microsoft Docs. Retrieved March 30, 2019. ^ a b "System requirements for Office". Office.com. Microsoft. Retrieved March 30, 2019. ^ "Update history for Office for Mac". Microsoft Docs. Retrieved March 30, 2019. ^ "Version 1.0 of today's most popular applications, a visual tour – Pingdom Royal". Pingdom. June 17, 2009. Retrieved April 12, 2016. ^ a b c d A. Allen, Roy (October 2001). "Chapter 12: Microsoft in the 1980's" (PDF). A History of the Personal Computer: The People and the Technology (1st ed.). Allan Publishing. pp. 12/25–12/26. ISBN 978-0-9689108-0-1. Retrieved November 7, 2010. ^ "Microsoft Office online, Getting to know you...again: The Ribbon". Archived from the original on May 11, 2011. ^ "The history of branding, Microsoft history". Archived from the original on May 28, 2009. ^ a b c d e Edwards, Benj (October 22, 2008). "Microsoft Word Turns 25". PC World. Retrieved November 7, 2010. ^ Schaut, Rick (May 19, 2004). "Anatomy of a Software Bug". MSDN Blogs. Archived from the original on February 1, 2010. Retrieved December 2, 2006. ^ a b Markoff, John (May 30, 1983). "Mouse and new WP program join Microsoft product lineup". InfoWorld. p. 10. Retrieved November 7, 2010. ^ Pollack, Andrew (August 25, 1983). "Computerizing Magazines". The New York Times. Retrieved April 24, 2013. ^ Lemmons, Phil (December 1983). "Microsoft Windows". BYTE. p. 48. Retrieved October 20, 2013. ^ Advertisement (December 1983). "Undo. Windows. Mouse. Finally". BYTE. pp. 88–89. Retrieved October 20, 2013. ^ Peterson, W.E. Pete (1994). Almost Perfect: How a Bunch of Regular Guys Built Wordperfect Corporation. Prima Publishing. ISBN 0-7881-9991-9. ^ a b c d e f Knight, Dan (May 22, 2008). "Microsoft Word for Mac History". Low End Mac. Retrieved November 7, 2010. ^ "Whole Earth Software Catalog". For a year, I waited for a heavier-duty word processor than MACWRITE. I finally got it— WORD. ^ a b c Schaut, Rick (February 26, 2004). "Mac Word 6.0". Buggin' My Life Away. MSDN Blogs. Archived from the original on May 14, 2004. Retrieved June 21, 2010. ^ "Atari announces agreement with Microsoft". Atarimagazines.com. April 25, 2008. Retrieved June 21, 2010. 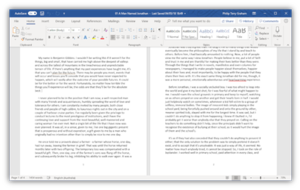 ^ "Feature Review: Microsoft Write". Atarimagazines.com. April 25, 2008. Retrieved June 21, 2010. ^ "Today's Atari Corp.: A close up look inside". Atarimagazines.com. April 25, 2008. Retrieved June 21, 2010. ^ Miller, Michael J. (November 12, 1990). "First Look: Microsoft Updates Look of And Adds Pull-Down Menus to Character-Based Word 5.5". InfoWorld. p. 151. Retrieved November 7, 2010. ^ Needleman, Raphael (November 19, 1990). "Microsoft Word 5.5: Should You Fight or Switch?". InfoWorld. p. 106. Retrieved November 7, 2010. ^ "Microsoft Word 5.5 for MS-DOS (EXE format)". Microsoft Download Center. Retrieved August 19, 2011. ^ "War of the Words". InfoWorld. February 7, 1994. pp. 66–79. Retrieved November 7, 2010. ^ a b Lockman, James T.W. (May 15, 1998). "UGeek Software Review: Microsoft Office 98 Gold for Macintosh". Archived from the original on December 3, 2010. Retrieved November 7, 2010. ^ Ericson, Richard (October 11, 2006). "Final Review: The Lowdown on Office 2007". Computerworld. Retrieved November 8, 2010. ^ Mendelson, Edward (May 11, 2010). "Microsoft Office 2010". PC Magazine. Retrieved November 8, 2010. ^ Mendelson, Edward (May 11, 2010). "Microsoft Office 2010: Office 2010's Backstage View". PC Magazine. Retrieved November 8, 2010. ^ Mendelson, Edward (May 11, 2010). "Microsoft Office 2010: The Word on Word". PC Magazine. Retrieved November 8, 2010. ^ "Introduction to Word Web App". Microsoft. Retrieved November 8, 2010. ^ a b McLean, Prince (November 12, 2007). "Road to Mac Office 2008: an introduction (Page 3)". AppleInsider. Retrieved November 7, 2010. ^ Tetrault, Gregory (January 2001). "Review: Microsoft Office 2001". ATPM: About This Particular Macintosh. Retrieved November 7, 2010. ^ Negrino, Tom (February 1, 2002). "Review: Microsoft Office v. X". Macworld. Retrieved November 7, 2010. ^ Lunsford, Kelly; Michaels, Philip; Snell, Jason (March 3, 2004). "Office 2004: First Look". Macworld. Retrieved November 7, 2010. ^ Friedberg, Steve (May 25, 2004). "Review: Microsoft Office". MacNN. Archived from the original on April 5, 2010. Retrieved November 7, 2010. ^ McLean, Prince (November 14, 2007). "Road to Mac Office 2008: Word '08 vs Pages 3.0". AppleInsider. Retrieved November 7, 2010. ^ McLean, Prince (November 12, 2007). "Road to Mac Office 2008: an introduction (Page 4)". AppleInsider. Retrieved November 7, 2010. ^ McLean, Prince (March 29, 2010). "New Office 11 for Mac sports dense ribbons of buttons". AppleInsider. Retrieved November 7, 2010. ^ Dilger, Daniel Eran (October 25, 2010). "Review: Microsoft's Office 2011 for Mac (Page 2)". Apple Insider. Retrieved November 7, 2010. ^ "OpenOffice.org 3.0 New Features — Microsoft Office 2007 Import Filters". Retrieved April 26, 2010. ^ "5 Appendix A: Product Behavior". [MS-DOC]: Word (.doc) Binary File Format (PDF). Redmond, WA: Microsoft. ^ "2.1 File Structure". [MS-DOC]: Word (.doc) Binary File Format (PDF). Redmond, WA: Microsoft. ^ a b Spolsky, Joel (February 19, 2008). "Why are the Microsoft Office file formats so complicated? (And some workarounds)". Joel on Software. ^ "2.1.1 WordDocument Stream". [MS-DOC]: Word (.doc) Binary File Format (PDF). Redmond, WA: Microsoft. ^ "What You Can Do with Word XML [Word 2003 XML Reference]". MSDN. 2004. ^ a b Casson, Tony; Ryan, Patrick S. (May 1, 2006). "Open Standards, Open Source Adoption in the Public Sector, and Their Relationship to Microsoft's Market Dominance". In Bolin, Sherrie. Standards Edge: Unifier or Divider?. Sheridan Books. p. 87. SSRN 1656616. ^ "Microsoft Expands List of Formats Supported in Microsoft Office, May 21, 2008". News Center. Microsoft. May 21, 2008. Retrieved April 24, 2013. ^ Fulton, Scott M. III (May 21, 2008). "Next Office 2007 service pack will include ODF, PDF support options". Betanews. ^ Andy Updegrove. "Microsoft Office 2007 to Support ODF – and not OOXML, May 21, 2008". Consortiuminfo.org. Retrieved June 21, 2010. ^ "Microsoft: Why we chose ODF support over OOXML, 23 May 2008". Software.silicon.com. Archived from the original on July 21, 2009. Retrieved June 21, 2010. ^ "Fact-sheet Microsoft ODF support" (PDF). odfalliance. Archived from the original (PDF) on June 11, 2009. Retrieved May 24, 2009. Microsoft Excel 2007 will process ODF spreadsheet documents when loaded via the Sun Plug-In 3.0 for Microsoft Office or the SourceForge "OpenXML/ODF Translator Add-in for Office," but will fail when using the "built-in" support provided by Office 2007 SP2. ^ Microsoft. "What happens when I save a Word 2007 document in the OpenDocument Text format?". Archived from the original on March 18, 2010. Retrieved April 5, 2010. ^ Goodwins, Rupert (October 3, 2005). "Office 12 to support PDF creation, 3 October 2005". News.zdnet.co.uk. Retrieved June 21, 2010. ^ Marson, Ingrid (October 6, 2005). "Microsoft 'must support OpenDocument', 6 October 2005". News.zdnet.co.uk. Retrieved June 21, 2010. ^ "May 08, 2006 – Microsoft Office to get a dose of OpenDocument". Zdnet.com.au. Retrieved June 21, 2010. ^ OpenDocument Fellowship (October 20, 2005). "OpenDocument Support: Tell Microsoft You Want It!, 20 October 2005". Opendocumentfellowship.com. Archived from the original on March 23, 2008. Retrieved June 21, 2010. ^ LaMonica, Martin (May 5, 2006). "Microsoft Office to get a dose of OpenDocument". CNET News. CBS Interactive. Retrieved June 21, 2010. ^ "Microsoft Expands Document Interoperability, July 5, 2006". Microsoft.com. July 5, 2006. Archived from the original on February 4, 2007. Retrieved June 21, 2010. ^ Jones, Brian; Rajabi, Zeyad (July 6, 2006). "Open XML Translator project announced (ODF support for Office)". Brian Jones: Office Solutions. Microsoft. Archived from the original on January 18, 2010. Retrieved April 24, 2013. ^ LaMonica, Martin (February 1, 2007). "Microsoft to release ODF document converter". CNet News. CBS Interactive. Retrieved April 24, 2013. ^ Lombardi, Candace (February 7, 2007). "Sun to release ODF translator for Microsoft Office". News.cnet.com. Retrieved June 21, 2010. ^ Paul, Ryan (July 7, 2007). "Sun releases ODF Plugin 1.0 for Microsoft Office, July 07, 2007". Arstechnica.com. Retrieved June 21, 2010. ^ "Download details: 2007 Microsoft Office Add-in: Microsoft Save as PDF or XPS". Microsoft.com. November 8, 2006. Retrieved June 21, 2010. ^ "Edit SVG images in Microsoft Office 365". Office Support. Microsoft. Retrieved 4 February 2019. ^ What's new in Word 2010. Retrieved July 1, 2010. ^ Improving the look of papers written in Microsoft Word, Retrieved May 30, 2010. ^ How to Enable OpenType Ligatures in Word 2010, Oreszek Blog, May 17, 2009. ^ Such as "How to delete a blank page in Word". Sbarnhill.mvps.org. Archived from the original on May 5, 2010. Retrieved June 21, 2010. ^ Alan Wood. "Unicode and Multilingual Editors and Word Processors for Mac OS X". ^ Neuburg, Matt (May 19, 2004). "TidBITS : Word Up! Word 2004, That Is". Db.tidbits.com. Archived from the original on July 8, 2012. Retrieved June 21, 2010. ^ McGhie, John (March 26, 2011). "Word's numbering explained". word.mvps.org. ^ Aldis, Margaret (March 26, 2011). "Methods for restarting list numbering". Word.mvps.org. ^ Gore, Karenna (February 9, 1997). "Cognito Auto Sum". Slate.com. Retrieved June 21, 2010. ^ Changes in Word 2010 (for IT pros). Technet.microsoft.com (May 16, 2012). Retrieved on July 17, 2013. ^ a b "Password protect documents, workbooks, and presentations". Microsoft Office website. Microsoft. Retrieved April 24, 2013. ^ "How to Restrict Editing in Word 2010/2007". Trickyways. June 22, 2010. Retrieved April 24, 2010. ^ "How safe is Word encryption. Is it really secure?". Oraxcel.com. Retrieved April 24, 2013. ^ Cameron, Janet (September 1984). "Word Processing Revisited". BYTE (review). p. 171. Retrieved October 23, 2013. ^ Manes, Stephen (February 21, 1984). "The Unfinished Word". PC Magazine. p. 192. Retrieved October 24, 2013. ^ McNeill, Dan (December 1987). "Macintosh: The Word Explosion". Compute! 's Apple Applications. pp. 54–60. Retrieved September 14, 2016. ^ Nimersheim, Jack (December 1989). "Compute! Specific: MS-DOS". Compute!. pp. 11–12. ^ "Data Stream". Next Generation. No. 21. Imagine Media. September 1996. p. 21. ^ "Microsoft Word 1.x (Windows) – Stats, Downloads and Screenshots :: WinWorld". WinWorld. Retrieved July 3, 2016. ^ Shustek, Len (March 24, 2014). "Microsoft Word for Windows Version 1.1a Source Code". Retrieved March 29, 2014. ^ Levin, Roy (March 25, 2014). "Microsoft makes source code for MS-DOS and Word for Windows available to public". Official Microsoft Blog. Retrieved March 29, 2014. ^ For the sake of superstition the next version of Office won't be called '13'. Office Watch.